Funding of over £3m has been announced today for four projects comprising a ground-breaking new plastics recycling partnership, Project Beacon, which has the potential to recycle all plastics in Scotland and beyond – even those that currently can’t be recycled. Project Beacon, at Binn Farm in Perthshire, is lighting the way to a circular world of complete plastics recycling thanks to new technologies and an innovative integrated approach, and is backed by £1.7m from Zero Waste Scotland’s Circular Economy Investment Fund (with around another £1.7m leveraged form the private sector) – supported by the Scottish Government and the European Regional Development Fund. 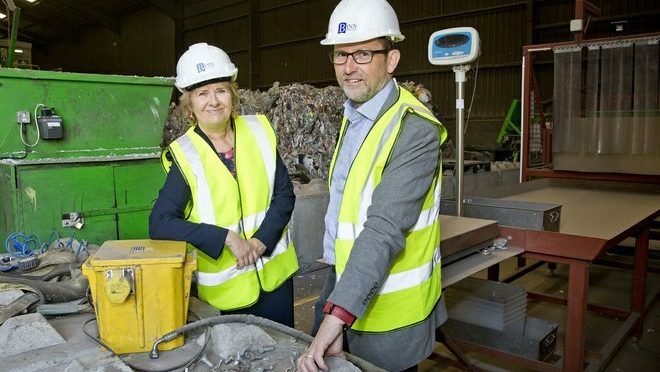 Scotland’s Environment Secretary visited Project Beacon this morning to see progress on the new state-of-the art recycling centre, which brings together a group of cutting-edge recycling firms: PI Polymer Recycling along with Recycling Technologies Ltd and Impact Recycling Ltd, with Binn Group signed on as supply chain partners. The system they’re developing uses new state-of-the-art separation systems to support mechanical recycling, fused with a game-changing chemical feedstock recycling process. This includes a patented process based on thermal cracking, which recycles end-of-life plastic waste that typically cannot be recycled using mechanical methods – for example, mixed, laminated, black, film and even contaminated plastic waste, as well as hard plastics. This new process produces a range of chemical constituents that can be used to create new virgin plastics, or other chemical products. It’s intended that this first demonstration facility will be up and running later this year. “Initiatives like Project Beacon have the potential to be potentially ground-breaking as they are finding new uses and economic potential for hard-to-recycle plastics which could make a significant contribution to reducing waste and increase recycling.